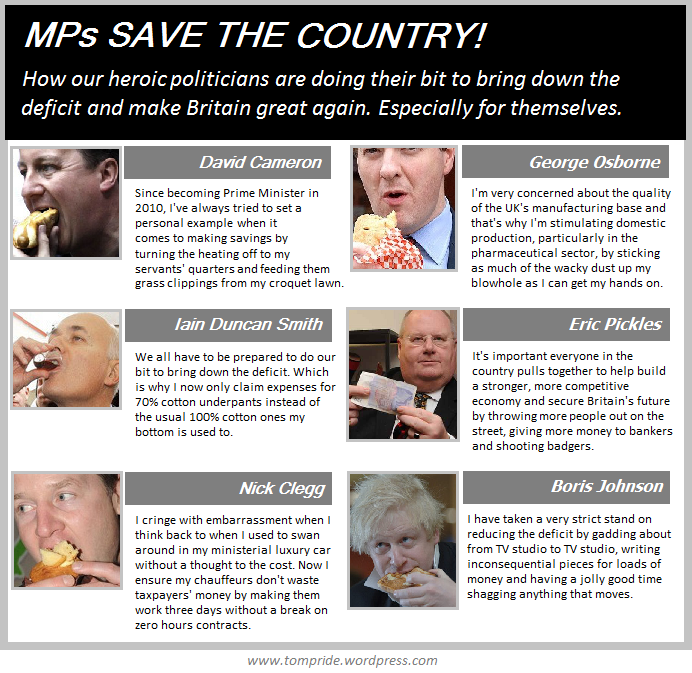 David Cameron delicately stuffing his face, with an intensity that not a single crumb will get away. From the toe curling irony that is Cameron through to the stomach turning image of Johnson with the thought of a cotton clad bottom that is quite possibly hairier than it’s owner’s bonce…. Each and every sound bite is about as appealing as…….. Well it’s all extremely unappealing to be honest. Reblogged this on Ladyfreebird750's Blog. Dear Tom ‘I’m not a Labour propagandist’ Pride…… It isn’t difficult to spot the glaring omission! No, not Nigel. Besides, it’s almost impossible to find any photos of him drinking, eating or smoking. Grow more Hemp, hang the whole corrupt bunch of them !!! Sounds like time to have another meeting of the Bullindon Club! Oh. Sorry. don’t they have that just after PMQ?